Commercial roofing projects involve much forethought and planning. There are many variables that must be considered to ensure that the roof is as hands-off as possible for the property owner and maintenance team. 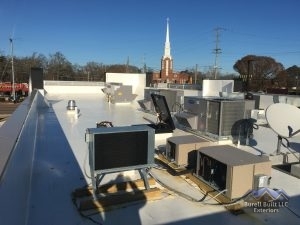 We know that you have more important business to tend to, so trust our highly experienced team at Burell Built Exteriors to manage all aspects of your commercial roof. Whether you’re looking for regular maintenance and small repairs, total roof replacement, or are overseeing new construction, call us for commercial roofing expertise for your Knoxville, TN or Chattanooga, TN project. Burell Built is a full service commercial roofing contractor specializing in roof replacement and repairs for occupied buildings. When it comes to a commercial roof, we understand there is no one-size-fits-all and our specialist are trained to tailor a plan towards the purpose and use of the type of building and business. With the advancements in roofing technology, we have the ability to save you time and money through our installation techniques with little to no disruption to your daily business activities. We partner with the industry-leading manufacturers to bring quality products and outstanding warranties to your commercial roof project. As an authorized installer, our material and labor warranties are provided through the manufacturers. These warranties include options for 15 year NDL, 20 year NDL, and beyond! We are proud to serve many premier companies and businesses in Knoxville, Chattanooga, and surrounding areas. Call us today at (865) 385-6926 to start planning your Chattanooga or Knoxville, TN commercial roofing project and to learn more about all the services that Burell Built Exteriors has to offer! Updated on September 20, 2016 at 8:32 pm by Burell Built Exteriors.